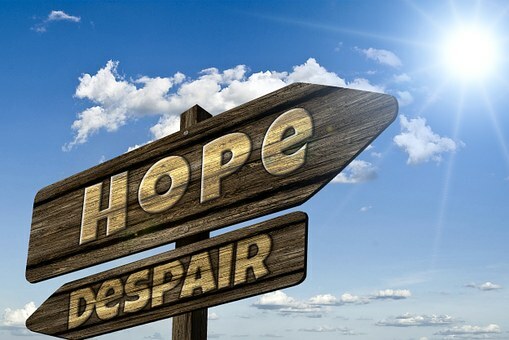 Refreshing Daily in God's Word: Daily Devotion: Where Is My Hope? Key Verse: Verse 15 - “And where is now my hope? as for my hope, who shall see it?" Job is convinced he is going to die. His body is weak and he is so very sick. He is ready to give up the ghost. If you’ve ever been so ill that even death looked sweet, then you know what Job is going through. Job indeed appears to have lost hope. Do you realize that it’s hope that brings life to us? It’s hope that gives us a reason to live. From Parade magazine comes the story of self-made millionaire Eugene Lang, who greatly changed the lives of a sixth-grade class in East Harlem. Mr. Lang had been asked to speak to a class of 59 sixth-graders. What could he say to inspire these students, most of whom would drop out of school? He wondered how he could get these predominantly black and Puerto Rican children to even look at him. Scrapping his notes, he decided to speak to them from his heart. “Stay in school,” he admonished, “and I’ll help pay the college tuition for every one of you.” At that moment the lives of these students changed. For the first time, they had hope. Said one student, “I had something to look forward to, something waiting for me. It was a golden feeling.” Nearly 90 percent of that class went on to graduate high school. In regard to Job, we read in Job 42:16 “After this lived Job an hundred and forty years…” You see, God can turn hopeless into hope, death into life, brokenness into wholeness. To God be the glory. ✞ Where is your hope? Anything other than God equals hopelessness.